MY NEAR-LIFE EXPERIENCE dances on the edges of reality and mysticism, guided by messages that both confound and illuminate. A saga of awakening to one’s true nature among myriad weeds of reaction, this book is exciting, funny, heartbreaking, and real. Find yourself reveling in the rich conversations with Spirits that ease tension between loved ones on either side of the veil in the conscious flow of life. You can also birth your tools of healing with the grace that is here for us all the time. 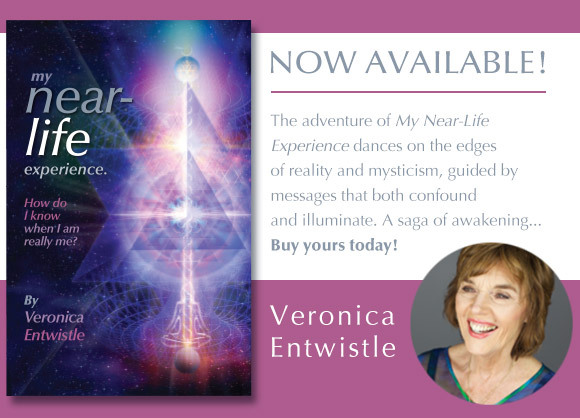 Veronica’s dramatic afterlife experiences include a visit by her deceased mother as a radiant, pink-lit being, and an encounter with her deceased father on the day he died: his energy flew around her bed and then careened through a tunnel. My name is Veronica Entwistle. I am an intuitive and energy counselor who, like many of you, is an explorer on the path of the new emerging humanities that are unfolding all around us. I use my gifts of intuition, as well as my rapport with various realms of consciousness and loving Guides and Angels, to create universal understandings within the murky stew of our experiences. This site is a portal where many of my discoveries are brought together so that I may lovingly share them with you. I offer tools to inspire your change, allowing you to fully harness the potential of your inner-self. We are all on this journey, let us grow and learn together. I host a weekly podcast interview show Paradigm Shifters. The show features the extraordinary individuals amongst us who usher in the new concepts that inspire changes in our lives and emerging worlds. Listen to my latest few episodes below! Be sure to subscribe to Paradigm Shifters on iTunes, or Stitcher! Now you can also listen to Paradigm Shifters on Speak Up Talk Radio on demand streaming! To do so: click this link, a new window will open, on that page use the scroll bar on the right side of the streaming player to find Paradigm Shifters (the shows are listed in alphabetical order). then click on Paradigm Shifters to listen. We truly live in extraordinary times. My blog is just one avenue for me to share with you some of the exciting happenings in the world that surrounds us. Our journeys are all interconnected – collectively, this blog belongs to us all. Tutored by spirit, I have developed a rapid style of intuitive counseling to guide you into being your true self. Readings with my guides and angels, and yours too, are like a loving mining expedition through your own spiritual energy fields. Together we shall heighten your conscious awareness to new levels and transform the constrictive energy that is manifesting from within. 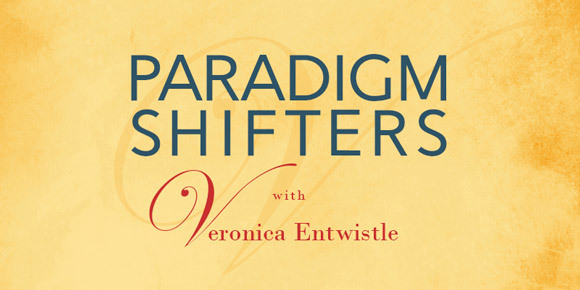 I host a weekly podcast interview show Paradigm Shifters that features the extraordinary individuals amongst us who usher in the new concepts that inspire changes in our lives and emerging worlds. My goal on the radio is to send waves of healing energy through the media systems. As an international intuitive and gifted seer, I have the ability to reach into both, body and mind, to explore on a meta-physical level – enabling me to lovingly guide you on your path of transformation and self-discovery.